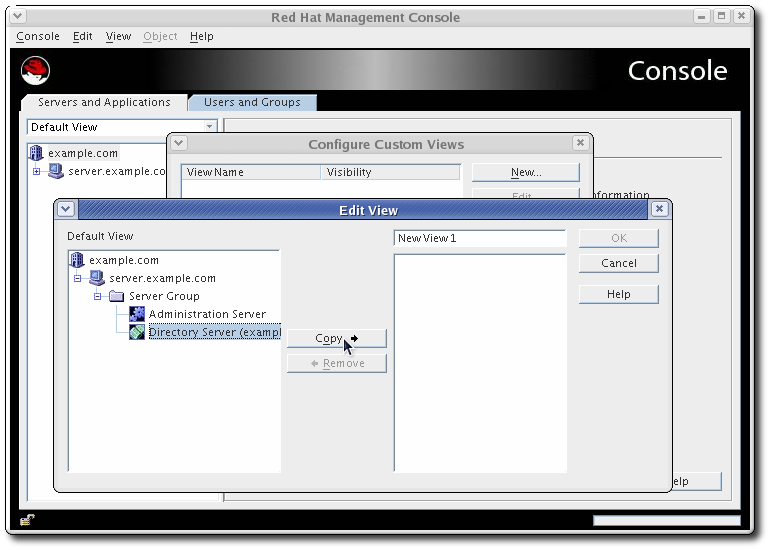 Red Hat Management Console is the user interface to manage Red Hat Directory Server and Administration Server configuration and directory information. There is a single main Console window which administers the servers (collected and identified in administration domains). The main Console allows you to open server-specific Consoles to manage the settings and information in individual instances. This chapter provides an overview of how the Console interacts with the Directory Server and Administration Server and walks through the Console windows and options. The Red Hat Console is an independent Java application which works in conjunction with instances of Red Hat Directory Server and Administration Server. Most server management functions are carried out in server-specific console windows for the Directory Server and Administration Server. Red Hat Console is part of a system that manages Red Hat Directory Server instances and the Administration Server and, therefore, information in the directory. Although Red Hat Directory Server, Red Hat Management Console, and Red Hat Administration Server work tightly with one another, each plays a specific role in managing servers, applications, and users. 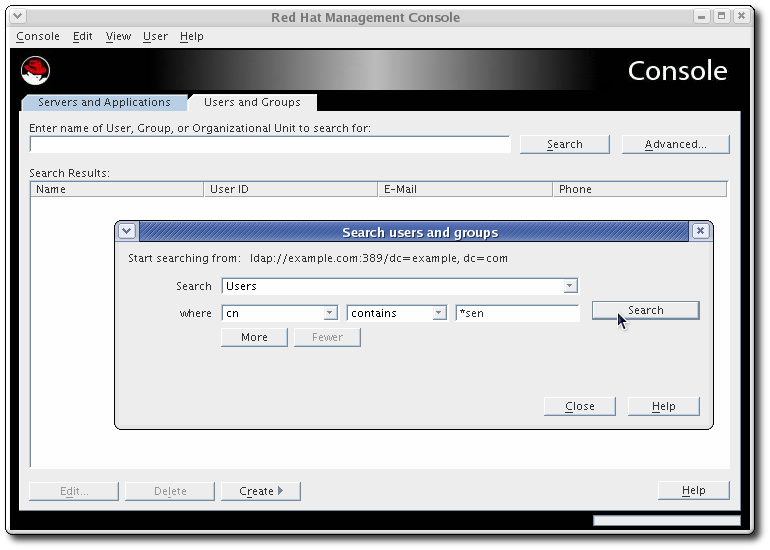 Red Hat Management Console is the front-end management application for Red Hat Directory Server. It finds all servers and applications registered in the configuration directory, displays them in a graphical interface, and can manage and configure them. The Main Console can also search for, create, and edit user and group entries in the user directory. When a user logs into Red Hat Management Console, the Console connects to the Administration Server over Hypertext Transfer Protocol (HTTP). The Administration Server receives requests to administer the different Directory Server instances and performs the changes to the configuration, such as changing a port number. 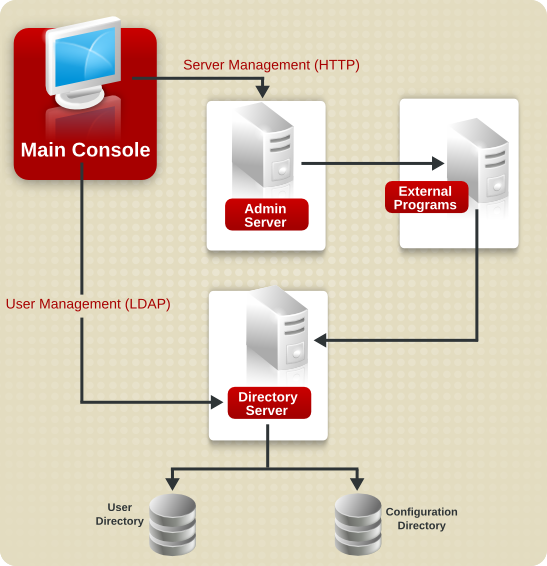 When a request is sent to the Red Hat Management Console to add or edit user entries, the Console sends a Lightweight Directory Access Protocol (LDAP) message directly to Directory Server to update the user directory. 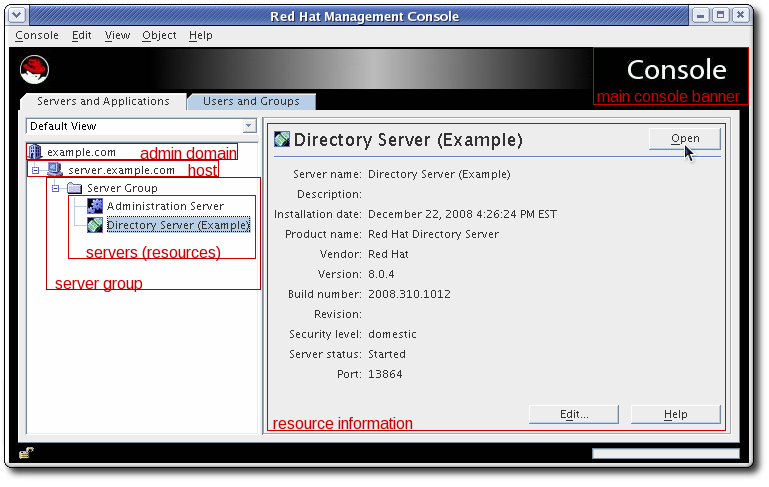 Red Hat Directory Server stores server and application configuration settings as well as user information. Typically, application and server configuration information is stored in one subtree of Red Hat Directory Server while user and group entries are stored in another subtree. With a large enterprise, however, configuration and user information can be stored in separate instances of Directory Server (which can be on the same host machine or on two different host machines). 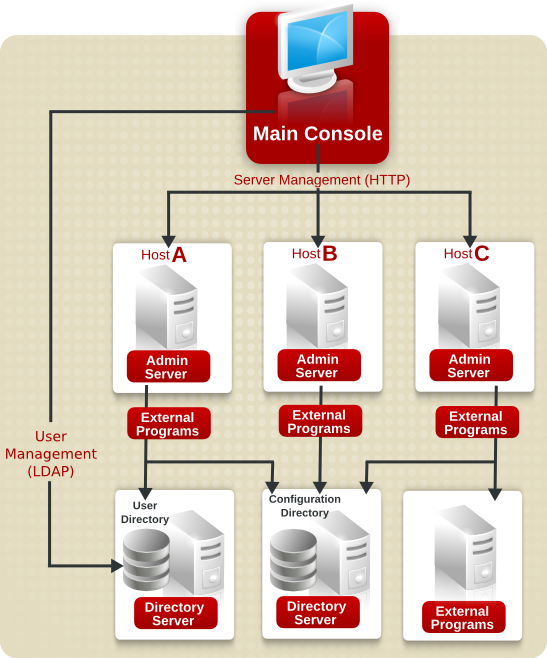 Figure G.2, “Simple System Using Red Hat Management Console” illustrates a relatively simple Red Hat Directory Server system. As an enterprise grows and needs change, additional hosts and Directory and Admin Servers can be added to the administration domain in the Console, so that a single Console can manage multiple Directory and Admin Servers. When the terms configuration directory and user directory are used in this guide, they define where the configuration information and the user information is stored, regardless of whether that is in the subtrees of a single instance of Directory Server or in two separate instances of Directory Server. There are five menu items in the top menu the Console. The options for each of these menus varies depending on the Console window open (the main Console, Directory Server Console, or Administration Server Console) and the types of objects available in that server area. Console Manages the Console session, such as closing the window or exiting the session entirely. For the main window, this menu also can be used to add and remove admin domain. For the Directory Server Console, this allows people to log in as a different user. 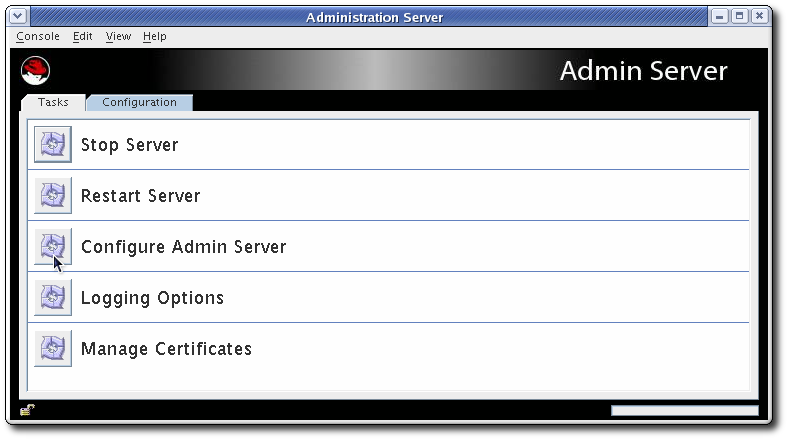 For the Administration Server Console, it manages security issues, such as certificates and tokens. Edit Sets display preferences, for all three Consoles. For the Directory Server Console, this also provides ways to copy, paste, and delete directory entries or text. View Sets whether to display certain parts of the Console window, such as the top banner, menus, and side navigation panes. This also refreshes the current display. For the Directory Server Console, this menu also sets what parts of the directory or which databases to view. Object Provides available operations for the active object; this is the same as the right-click menu for the active area or entry. For the main window, this menu simply opens or deletes a server instance. For the Directory Server Console, this provides all of the configuration options for the directory entries, such as advanced property editors or creating new entries. For the Administration Server Console, this opens a configuration editor, starts, and stops the server. Help Opens context-specific help for the current Console area. The navigation tree displays the Red Hat Directory Server topology, a hierarchical representation of all the resources (such as servers and hosts), that are registered in a configuration directory. The top of the topology is the administration domain. An administration domain is a collection of host systems and servers that share the same user directory. The server which hosts Directory Server or Administration Server instances belongs to the admin domain; that is the host. A server group consists of all Directory Servers that are managed by a common Administration Server. A number of server groups can exist within an administration domain. The Users and Groups tab can search for user and group entries in any Directory Server administered by the Console. Any of the returned entries can be edited or deleted through this tab, assuming that the users has the proper access permissions. New entries can also be created through the Users and Groups tab. Switch the directory being searched or where the entries are added through the options in the Users menu, as described in Section G.4.1, “Searching for Users and Groups”. The main Console can open into two server-specific windows to manage the Administration Server and Directory Server. These windows are opened by clicking the server name in the navigation area, and then clicking the Open button in the resources area. The Directory Server Console manages the specific Directory Server instance configuration, including the port number, TLS settings, and logging. The Directory Server Console also manages the directory information (entries) and directory operations like importing and exporting databases, creating suffixes, and extending the schema. Similar to the main Console, the Directory Server Console tabs have a navigation area on the left and a center panel that displays information about the active setting, entry, or database. 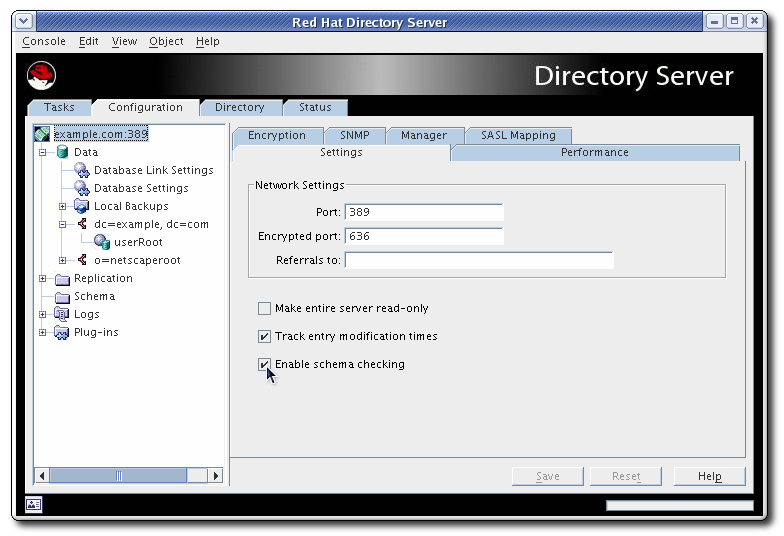 The procedures for using the Directory Server Console to manage the Directory Server configuration and directory entries is covered in the Red Hat Directory Server Administration Guide. The Administration Server itself administers the configuration of other servers, especially the configuration and user directories for the server group. The Administration Server Console manages the Administration Server settings and the settings for these two Directory Server directories; whenever the settings are changed in the Directory Server configuration, the modifications must be carried into the Administration Server configuration for the server to properly manage those servers. The procedures for using the Administration Server Console to manage the Administration Server configuration and associated directory services is covered in the Using the Admin Server guide.